I haven’t blogged much about the freshman design seminar lately. So far, I’ve had the students take the training to use the drill press and scroll saw in the (rather limited) Baskin School of Engineering Fab Lab, and had them look for projects they might be interested in doing. At one point, before the quarter started, I looked into using the Neptune software from Boston University (which I found out about at the iGEM Jamboree) for designing and building low-cost microfluidic systems, but the software was nowhere near ready for use by freshmen, and I did not have the time get all the pieces figured out and working with the somewhat different hardware tools we had available. So, as in previous years, I’ll be counting on the students to come up with a couple of projects that they are interested in and capable of making a good start on. This is only a 2-unit class, so they only have 6 hours a week on it, 3 of which are in class. I assigned them the task of finding interesting projects they would want to work on and providing links to web pages about the projects. I think that they may have been overly influenced by an example I brought up in class, but there seems to be a fairly large group interested in an EMG-controlled prosthesis. That’s a bit ambitious for a 2-unit freshman course, but we could do an EMG, we could do some simple programming for servo motors (I think that more sophisticated motor control would take more time than we have), and we could probably get an already designed hand printed or laser-cut. Vernier has a simple (but kind of expensive) EKG sensor that records the electrical events happening within the heart. This sensor uses a digital control unit as well as an EKG sensor. Also, we would need some additional software help. Vernier also has a project that is an LED color mixer that uses digital control unit. This will have the ability to shine red, blue, and green light, any of which can be shone individually or with other lights. Similarly to the EKG sensor, Vernier has a blood pressure sensor that calculates blood pressure. Vernier uses a blood pressure sensor and digital control unit in order to carry out the experiment. This device has a cuff that is placed on the upper arm to in order to pressurize the arteries. The sensor monitors the pressure in units of mm Hg. I thought this website was interesting as they have links to interesting DIY lab equipment such as the micro centrifuge. -The basics of an EMG and how they work. Materials and a quick blurb about cost vs learning. It would actually cost more to buy the components and build it ourselves than it would be to just buy a pre-built MyoWare. That being said, the learning experience is important. This is a page detailing how to create a simple EMG. This is a blood pressure diagnostic devise. We can work on sensors, and it seems like a freshmen project. So I saw this, and I noticed the price. But if we could make the individual parts our self, and at the same time learn to implement human movement into a devise such as this it would be awesome. The correlation of movements are what interest me in this project. This is a link that somewhat describes EMG with lots of article links at the bottom. 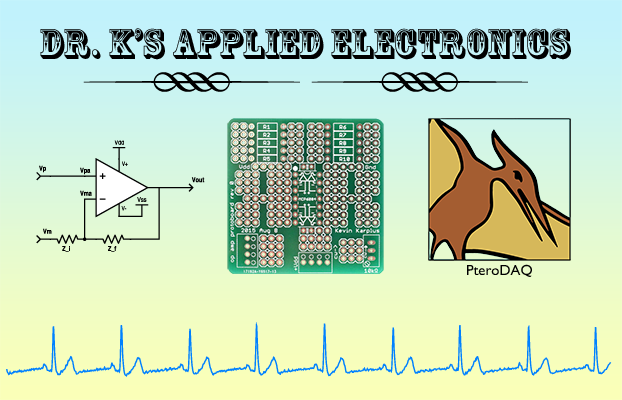 Homemade Electrocardiograph/ Will ONLY cost about $10/ Will take about 2-3 weeks/ Code available in a zip file. 3D Printed Bionic Arm/ costs about $200/ Open sourced/ Developed as a cheaper alternative to prosthetics/ Site has tutorials from assembling to programming. The Homemade ECG really seems like a cool project, but there was a warning about how it was dangerous because to try it someone has to attach the sensors to their chest. I like the HACKberry prostetic hand. We would need to choose a specific part out of it that we want to work on since it is a big project, I think. I would like to focus on learning how to program the hand to open and close. Also, I would love to learn how to design and construct it. for this project, I want to work on making a functional mechanic hand. If it’s possible I’d like the glove to be able to massage the foot as if it was “kneading”/”squeezing” the foot. I’m submitting an application for the Santa Cruz Mini Maker Faire 2017 (2017 April 29), since last year’s Mini-Maker Faire went well (see Santa Cruz Mini Maker Faire went well). This year I’m getting my application in early, rather than dithering about it for months as I did last year. I have less free time to prepare the display this year, but I have a better notion what I want to do, so it should not take long to get ready. Last year’s banner, which I can reuse this year. I might also make a shorter one that will fit on the front of the table. I’ll bring a tabletop full of electronics projects, as last year (see https://gasstationwithoutpumps.wordpress.com/2016/04/16/santa-cruz-mini-maker-faire-went-well/ ). Laptops demonstrating free software to turn cheap microprocessor boards into data-acquisition systems suitable for home labs and science-fair projects. Homemade LED desk lamp and stroboscope. Several of the projects will be interactive (an optical pulse-rate monitor, oscillators that can be adjusted to change Lissajous figures on an oscilloscope, …). A few changes from last year: a more reliable pulse-monitor design and a new USB oscilloscope. See your pulse on a home-made optical pulse monitor! Record air pressure waveforms using free PteroDAQ data acquisition software! Play with a bright custom-design LED stroboscope! Control fancy Lissajous patterns on an oscilloscope! I removed mention of an EKG, because I decided that it was too much trouble to tether myself with EKG leads all day. Kevin Karplus has been an engineering faculty member at UCSC since 1986, but has done hobbyist electronics on-and-off since the 1960s. For the past few years he has been working on a low-cost textbook to make hands-on analog electronics accessible to a wider range of students. Several of the projects on display are from the textbook. I’ll list the changes in two sections: changes that were made since the October 2016 release, then changes that were made in the Oct 2016 release (because I don’t seem to have posted those to the blog). Fleshed out assignment schedule and moved to Preface. Rearranged several of the early chapters (without significant content change) for better ordering of assignments. Added mention of Analog Discovery 2 to oscilloscope chapter, replaced some Bitscope traces with Analog Discovery~2 traces. Added bonus frequency response activity to pressure sensor lab. Added Lego-brick pictures for the optical-pulse-monitor lab. Revised all chapters and labs from the microphone chapter to the EKG lab (the second half of the course). Many of the changes were minor revisions (typo fixes, indexing, changing to numbered exercises, spell check). Added exercises to the microphone chapter and moved some exercises from the microphone lab to the microphone chapter. Moved some of the oscilloscope introduction from the microphone lab to the sampling lab. Rewrote DC analysis of microphone to use function generator, rather than potentiometer, for variable voltage. Added R+L figure to loudspeaker chapter, rather than referring to impedance chapter. Moved inductor description to new chapter just before loudspeakers. Added RMS power exercise and R-L plot exercise to loudspeaker chapter. Moved some intro amplifier material from preamplifier lab to pressure-sensor lab, reflecting change in order of labs. Moved some instructions about color coding wiring from preamplifier to an earlier lab. Added mention of using earbuds instead of loudspeakers for preamplifier lab. Redid Miller plateau oscilloscope trace using Analog Discovery 2, using smaller gate resistor to get higher speed. Fixed clipping on several schematics (the Vdd power symbol gets clipped if at the top of the schematic—a known bug in SchemeIt). 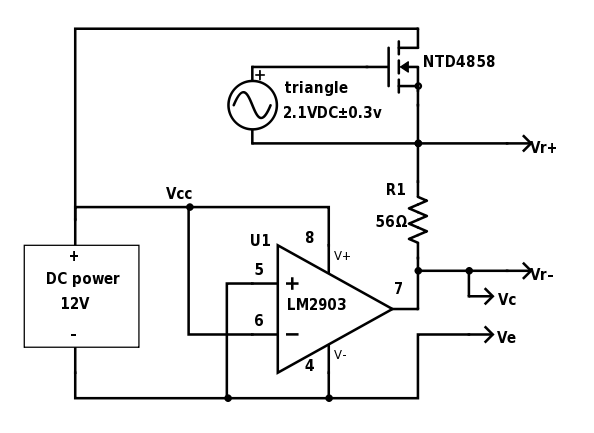 Put inductive load in the single-nFET driver schematic, including flyback diode. Added explanation of why the crude model for computing slew rate is so far off. Removed most references to obsolete AOI514 nFETs (using NTD4858N nFETs instead). This required gathering new data to characterize the transistors. Redid the section on open-collector outputs for LM2903 comparators. Added table of conductivity for NaCl solutions. Added section on 4-electrode conductivity measurements. Moved information about nulling ohmmeters when measuring resistance from electrode lab to loudspeaker lab. Reiterated some of the EKG safety info in the EKG lab. Added more background to first chapter (logarithms, picture of complex plane) and started chapter numbering at 1 instead of 0. Rearranged chapters for new lab order, with all the audio labs after the pressure sensor and optical pulse monitor. Updated information on using lead-free solder. Added a generic block diagram to lab report guidelines, and added definition of “port” to the block diagram discussion. Added subsection on Thévenin equivalent of voltage divider. Added section on series and parallel connections to resistance chapter, to reflect lower prerequisite expectations of course. Moved some gnuplot exercises into thermistor lab from sampling and aliasing, to reflect new lab order, also moved PteroDAQ installation instructions. Added picture of metal thermometer to thermistor lab. Added voltmeter connection schematic to DAQ chapter. Moved details of PteroDAQ out of DAQ chapter to separate appendix. Added potentiometer schematic and photo to resistance chapter. Split data acquisition from sampling and aliasing into separate chapters. Improved figure showing aliasing and Nyquist frequency. Added pictures for wire stripping and flying resistors to sampling lab. Added scaffolding for oscilloscope probe exercise. Hysteresis measurement changed to use function generator. Moved multi-stage amplifier discussion to beginning of amplifier chapter and beefed it up. Added introduction to differential amplifiers before instrumentation amps and op amps. Added pH meter block diagram to beginning of amplifier chapter. Moved discussion of clipping to the end of the instrumentation amplifier section. Added active low-pass filters to amplifier chapter. Added chapter on transimpedance amplifiers with section on log-transimpedance amplifiers and rewrote pulse-monitor lab to use logarithmic current-to-voltage conversion. Added discussion of absorbance of melanin, fat, and water to blood section. Moved the instrumentation amplifier internals to new chapter, before the EKG chapter. Simplified the sensitivity calculation for LEDs and phototransistors, making the exercise more productive. Added text to caption of microphone preamp photo. Moved loudness section from the amplifier chapter to the microphone chapter. Added notes at end of loudspeaker lab to improve student reporting of models. Made all exercises be numbered, and changed most of the prelab questions into numbered exercises. Added equipment-needed lists to the beginning of each lab. Redrew several block diagrams using draw.io, and added captions to several figures to indicate what drawing tool was used. Changed caption formatting to be more distinctly different from body text. 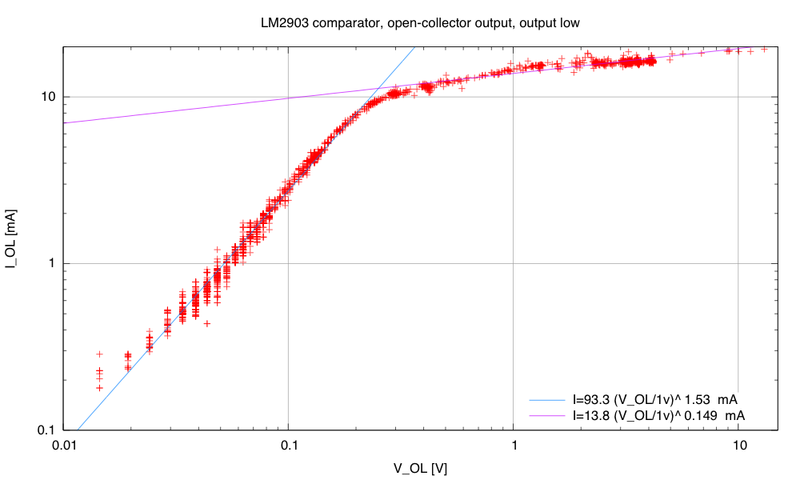 There are two regions of operation for the open-collector output of the LM2903. In the saturation region, the current goes up slowly with voltage (as about V^0.15, while in the “linear” region, it goes up as about V^1.5). The transition occurs when VOL is about 0.25 V, so we are almost always in the saturation region. I decided to redo the plot using the Analog Discovery~2, as I now include the open-collector curve in the textbook (in an optional section, since we no longer use open-collector comparators). I used a 12V wall-wart and both the function generator and oscilloscope functions. I used the “custom channel” and XY plot features to get the I-vs-V plot on the screen (though I saved the data and replotted with gnuplot, to superimpose different runs). I also averaged 10 sweeps to reduce noise. R1 was 56Ω for testing high voltages and currents, and R1 was 2.2kΩ for testing low voltages and low currents. The triangle-wave generator and the nFET makes a variable load for the comparator, from slightly more than R1 up to about 1MΩ. 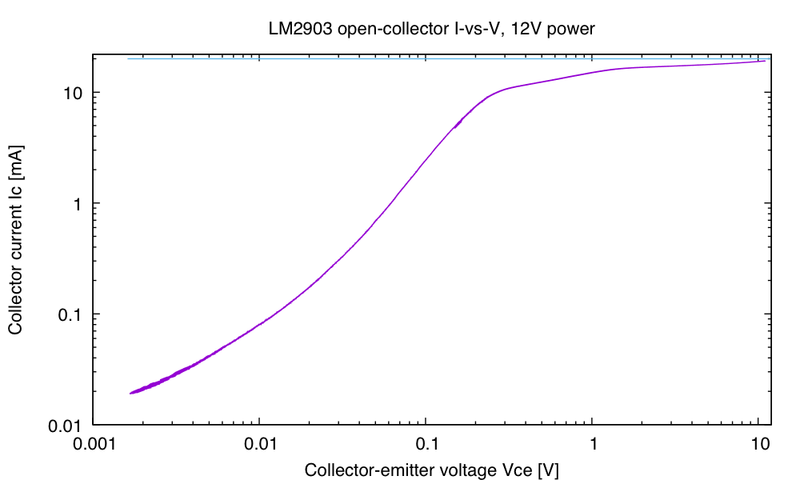 Even up to 11V, the LM2903 collector stays below the 20mA maximum current, but I’d want to make sure that there was some current-limiting resistor for any power-supply voltage above 12V. The results with the Analog Discovery 2 are much cleaner than my old results, which were most likely done with an Arduino, which has a very low resolution ADC.